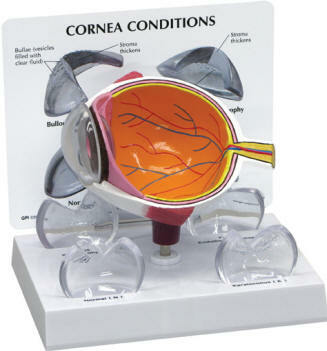 This normal oversized eye model includes interchangeable lenses that show various types of cataract conditions including: subcapsular, capsular, mature, cortical and nuclear. 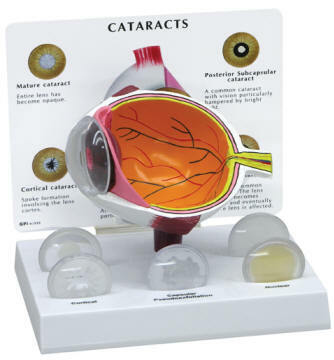 The education card highlights the visual effect of cataracts. aComes wiih base. 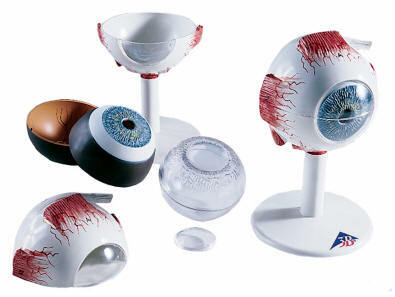 This three times life-size anatomical model of the eye dissects into: both halves of sclera with cornea and eye muscle attachments, both halves of choroid with iris and retina, lens, and vitreous humour. Comes with base. 9 x 9 x 15 cm. Two views are shown of this model. 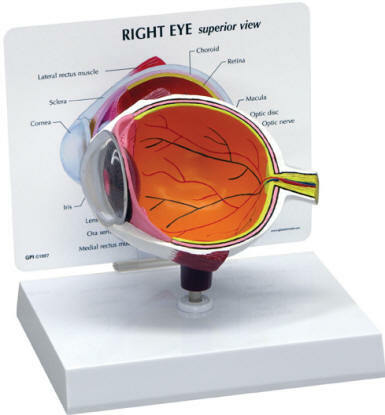 Same dissection as above, but eye is mounted in its natural position in the bony orbit of the eye floor and medial wall. 18 x 26 x 19 cm. 3.5 times life-size. 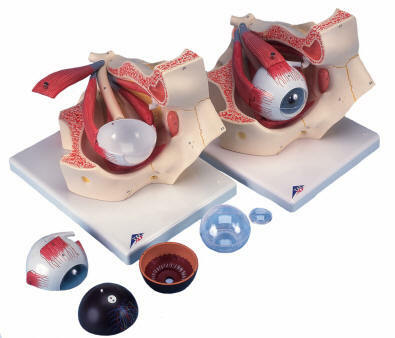 This anatomical model of the human eye shows it with optic nerve in its position in the bone-orbit (floor and medial wall). Dissects into: both halves of the sclera with optic nerve and eye muscles, cornea, lens, vitreous humour, M. rectus superior and M. rectus lateralis. Comes with base.